Configuration for interface "Loopback Pseudo-Interface 1"
then a computer name change would have an adverse impact. Do you want to proceed (Y or N)? The computer needs to be restarted in order to complete the operation. 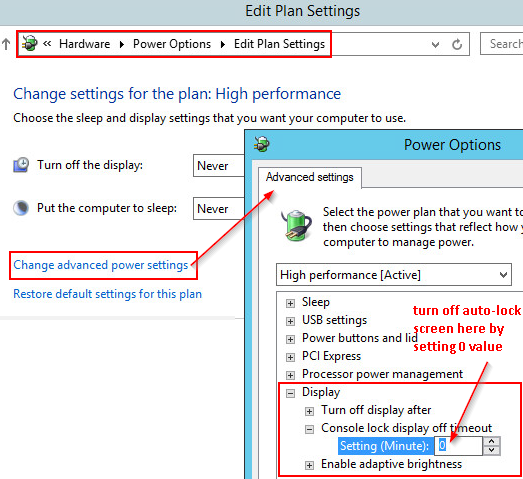 Unlocked the missing Power Settings feature in Server 2012.
a. The new Display section Console lock display off timeout is now available. Set timeout to 0 to turn it off. The database option that must be set to ON to enable the required support. How a session requests the specific type of row versioning. Use the default read-committed isolation level, or run the SET TRANSACTION ISOLATION LEVEL statement to specify the READ COMMITTED isolation level. This can be done after the transaction starts. Requires the execution of SET TRANSACTION ISOLATION LEVEL to specify the SNAPSHOT isolation level before the start of the transaction. The version of data read by statements. All data that was committed before the start of each statement. All data that was committed before the start of each transaction. Reverts from row versions to actual data to select rows to update and uses update locks on the data rows selected. Acquires exclusive locks on actual data rows to be modified. No update conflict detection. Uses row versions to select rows to update. Tries to acquire an exclusive lock on the actual data row to be modified, and if the data has been modified by another transaction, an update conflict occurs and the snapshot transaction is terminated. Integrated support. Cannot be disabled. Cannot create index on view 'Employees_View' because the view is not schema bound. Syntax '*' is not allowed in schema-bound objects. Cannot create index on view 'Employees_View'. It does not have a unique clustered index. Cannot create index on view 'NORTHWND2.dbo.Employees_View'. It contains text, ntext, image, FILESTREAM or xml columns. Apr 9 22:18:27 vmxdb01 journal: Oracle Audit: LENGTH: "274" SESSIONID: "190024" ENTRYID: "1" STATEMENT: "1" USERID: "C##DONGHUA" USERHOST: "vmxdb01.dbaglobe.com" TERMINAL: "pts/1" ACTION: "100" RETURNCODE: "1045" COMMENT$TEXT: "Authenticated by: DATABASE" OS$USERID: "oracle" DBID: "2860248834"
Apr 9 22:18:45 vmxdb01 journal: Oracle Audit: LENGTH: "283" SESSIONID: "200019" ENTRYID: "1" STATEMENT: "1" USERID: "SYSTEM" USERHOST: "vmxdb01.dbaglobe.com" TERMINAL: "pts/1" ACTION: "100" RETURNCODE: "0" COMMENT$TEXT: "Authenticated by: DATABASE" OS$USERID: "oracle" DBID: "2860248834" PRIV$USED: "5"
Apr 9 22:18:59 vmxdb01 journal: Oracle Audit: LENGTH: "227" SESSIONID: "200019" ENTRYID: "1" USERID: "SYSTEM" ACTION: "101" RETURNCODE: "0" LOGOFF$PREAD: "4" LOGOFF$LREAD: "3013" LOGOFF$LWRITE: "20" LOGOFF$DEAD: "0" DBID: "2860248834" SESSIONCPU: "13"
Apr 9 22:18:59 vmxdb01 journal: Oracle Audit: LENGTH: "288" SESSIONID: "200020" ENTRYID: "1" STATEMENT: "1" USERID: "C##DONGHUA" USERHOST: "vmxdb01.dbaglobe.com" TERMINAL: "pts/1" ACTION: "100" RETURNCODE: "0" COMMENT$TEXT: "Authenticated by: DATABASE" OS$USERID: "oracle" DBID: "2860248834" PRIV$USED: "5"
Quick fix for error "memory_target needs larger /dev/shm"
WARNING: You are trying to use the MEMORY_TARGET feature. This feature requires the /dev/shm file system to be mounted for at least 1342177280 bytes. /dev/shm is either not mounted or is mounted with available space less than this size. Please fix this so that MEMORY_TARGET can work as expected. Current available is 1025826816 and used is 665677824 bytes. Ensure that the mount point is /dev/shm for this directory.